California, Florida, Hawaii, Massachusetts, New York, New Jersey, and Rhode Island, among others. Portuguese Americans (portugueses-americanos), also known as Luso-Americans (luso-americanos), are American citizens and residents of the United States who are connected to the country of Portugal by birth, ancestry or citizenship. Americans and others who are not native Europeans from Portugal but originate from countries that were former colonies of Portugal do not necessarily self-identify as "Portuguese-American", but rather as their post-colonial nationalities, although the so-called retornados from former Portuguese colonies are ethnically or ancestrally Portuguese. An estimated 191,000 Portuguese nationals are currently living in the United States. Some Melungeon communities in rural Appalachia have historically self-identified as "Portuguese", despite having no Portuguese origin. Bilateral ties date from the earliest years of the United States. Following the American Revolutionary War, Portugal was the first neutral country to recognize the United States. Portuguese people have had a very long history in the United States, since 1634. The first documented Portuguese to live in colonial America was Mathias de Sousa, a Sephardic Jew. The oldest synagogue in the country, the Touro Synagogue, is named after one of these early Portuguese Jews, Isaac Touro. Some of the earliest European explorers to reach continental North America in the Age of Discovery were Portuguese explorers, such as João Fernandes Lavrador. Navigators, like the Miguel Corte-Real family, may have visited the North American shores at the beginning of the 16th century. There is a historic landmark, the Dighton Rock, in southeastern Massachusetts, that a small minority of scholars believe testifies their presence in the area. Portuguese explorer João Rodrigues Cabrilho explored the California coast for the first time. During the Colonial period, there was a small Portuguese emigration to the present-day U.S., especially to the islands of Martha's Vineyard and Nantucket. Peter Francisco, the giant soldier in the US Continental Army, is generally thought to have been born Portuguese, from the Azores. In the late 19th century, many Portuguese, mainly Azoreans and Madeirans, emigrated to the eastern U.S., establishing communities in New England coastal cities, primarily but not limited to Providence, Bristol and Pawtucket in Rhode Island, and New Bedford, Taunton, and Fall River in Southeastern Massachusetts. A Portuguese community existed in the vicinity of the Carpenter Street Underpass in Springfield, Illinois, one of the earliest and largest Portuguese settlements in the Midwestern United States. By the early twentieth century, the project area represented the western extension of a neighborhood known as the “Badlands.” The Badlands was included in the widespread destruction and violence of the Springfield Race Riot in August 1908, an event that led to the formation of the National Association for the Advancement of Colored People (NAACP). The Carpenter Street archaeological site possesses local and national significance for its potential to contribute to an understanding of the lifestyles of multiple ethnic/racial groups in Springfield during the nineteenth and early twentieth centuries. On the West Coast in California there are Portuguese communities in San Francisco, Oakland, San Jose, Santa Cruz, the Central Valley, the dairy producing areas of the Los Angeles Basin, and San Diego, in connection to Portuguese fishermen and settlers emigrating to California from the Azores. There are also connections with Portuguese communities in the Pacific Northwest in Astoria, Oregon, and Seattle, Washington, and British Columbia, Canada as well. Many Portuguese settled in the Kingdom of Hawaii, before its overthrow by the United States in the late 19th century. In the 1840s, whaling ships were the way to get to America, after a slow voyage of two to three years. In the early 1700s, Massachusetts dominated the whaling industry with Nantucket, Cape Cod and New Bedford. By the early 19th century, New Bedford had become the center of whaling in America. When whalers were out at sea, they would frequently stop in the Azores to recruit crew members for help. At the end of their voyage, they docked in New England, where crew members often settled as immigrants. Today, one can visit the Whaling Museum in New Bedford, Massachusetts and encounter authentic Portuguese whaling history. In the mid-late 20th century, there was another surge of Portuguese immigration in America, mainly in the northeastern United States (New Jersey, New York, Connecticut, Rhode Island, Massachusetts). There are Portuguese clubs, principally in the larger cities of these states, which operate with the intention of promoting sociocultural preservation as venues for community events, athletics, etc. Many houses and apartments in The Ironbound neighborhood of Newark, New Jersey are embellished with elaborate azulejos. One common image is Our Lady of Fatima, seen here. Many Portuguese Americans may include descendants of Portuguese settlers born in Africa (like Angola, Cape Verde, and Mozambique) and Asia (mostly Macanese people), as well Oceania (Timor-Leste). There were around 1 million Portuguese Americans in the United States by 2000. As with other European Americans, some Portuguese surnames have been changed to align with more American sounding names, for example Rodrigues to Rogers, Oliveira to Oliver, Martins to Martin, Pereira to Perry, Moraes or Morais to Morris, Magalhães to McLean, Souto to Sutton, Moura to Moore, Serrão to Serran, Silva to Silver or Sylvia, Rocha to Rock (or Stone), Madeira to Wood, and Pontes to Bridges. A general contribution the Portuguese people have made to American music is the ukulele, which originated in Madeira and was initially popularized in the Kingdom of Hawaii. John Philip Sousa was a famous Portuguese American composer most known for his patriotic compositions. A large amount of mingling took place between Chinese and Portuguese in Hawaii. There were very few marriages between European and Chinese people with the majority being between Portuguese and Chinese people. These unions between Chinese men and Portuguese women resulted in children of mixed parentage, called Chinese-Portuguese. For two years to June 30, 1933, 38 of these children were born; they were classified as pure Chinese because their fathers were Chinese. In 1957–58, the Capelinhos volcano erupted on the Azorean island of Faial, causing massive destruction from lava and smoke. President Dwight Eisenhower signed the Azorean Refugee Act in 1958, making 1,500 visas available to the victims of the eruption. An extension was enabled in 1962, providing opportunities for even more immigrants. According to the United States Census from 2000, there were 1,176,615 Portuguese-Americans, the majority being of Azorean descent. This led to the passing of the 1965 Immigration Act, which stated if someone has legal or American relatives in the United States, they could serve as a sponsor and, therefore could be a legal alien. This act dramatically increased Portuguese immigration into the 1970s and 1980s. There are three anthologies of Portuguese-American literature: Luso-American Literature: Writings by Portuguese-Speaking Authors in North America edited by Robert Henry Moser and António Luciano de Andrade Tosta and published in 2011, The Gávea-Brown Book of Portuguese-American Poetry edited by Alice R. Clemente and George Monteiro, published in 2013, and Writers of the Portuguese Diaspora in the United States and Canada: An Anthology edited by Luís Gonçalves and Carlo Matos, and published in 2015. The list of accomplished writers is considerable: Katherine Vaz, Frank X. Gaspar, Millicent Borges Accardi, Sam Pereira, Nancy Vieira Couto, Alfred Lewis, Charles Reis Felix and John dos Passos. Largest self-reported ancestry groups in New England. Americans of Portuguese descent plurality shown in grey. Portuguese-Americans are the fourth largest ethnic group in the state of Hawaii, fifth largest group in Rhode Island and the eighth largest group in Massachusetts. For a more comprehensive list, see List of Portuguese Americans. ^ "2015 American Community Survey 1-Year Estimates: Selected Social Characteristics in the United States". United States Census Bureau. 2015. Retrieved 2017-01-30. ^ Robert L. Santos (1995). "Azorean Immigration Into the United States". Archived from the original on February 6, 2012. Retrieved May 4, 2015. ^ "Associação Dr. Manuel Luciano da Silva" Acervo Documental". Archived from the original on May 23, 2003. Retrieved December 17, 2006. ^ Martin, Andrea. "Carpenter Street Underpass" (PDF). Springfield Railroads Improvement Project. US Department of Transportation Federal Railroad Administration and the Illinois Historic Preservation Agency. ^ a b c d Ponta-Garça, Nelson, director. Portuguese in New England. 2016. ^ "Ukulele origins from Madeira Portugal". Retrieved 2007-02-12. ^ United States Bureau of Education (1921). Bulletin, Issues 13-18. U.S. G.P.O. p. 27. Retrieved 2010-07-14. ^ Romanzo Adams (2005). Interracial Marriage in Hawaii. Kessinger Publishing. p. 154. ISBN 978-1-4179-9268-3. Retrieved 2010-07-14. ^ Margaret M. Schwertfeger (1982). Interethnic Marriage and Divorce in Hawaii: A Panel Study of 1968 First Marriages. Kessinger Publishing. Retrieved 2010-07-14. ^ Romanzo Adams (2005). Interracial Marriage in Hawaii. Kessinger Publishing. p. 32. ISBN 978-1-4179-9268-3. Retrieved 2010-07-14. ^ "Text of H.Res. 1438 (110th): Commemorating the 50th anniversary of the Azorean Refugee Act of 1958 and celebrating ... (Passed the House version) - GovTrack.us". GovTrack.us. Retrieved 2018-02-14. ^ "Portuguese American Population Numbers". Retrieved 2007-02-12. ^ "2016 American Community Survey Selected Population Tables". American FactFinder. U.S. Census Bureau. Retrieved 2018-03-02. Barrow, Clyde W. (2002). Portuguese-Americans and Contemporary Civic Culture in Massachusetts. Leal, João, and Wendy Graça (2011). Azorean Identity in Brazil and the United States: Arguments about History, Culture, and Transnational Connections. Dartmouth, Massachusetts, Tagus Press. Warrin, Donald, and Geoffrey L. Gomes (2013). Land, as Far as the Eye Can See: Portuguese in the Old West. Dartmouth, Massachusetts: Tagus Press. 376 pages. Traces the experiences of Portuguese immigrants as frontier settlers. Williams, Jerry R. (2007). In Pursuit of Their Dreams: A History of Azorean Immigration to the United States (2nd ed.). North Dartmouth, Massachusetts: University of Massachusetts Dartmouth. Wolforth, Sandra (1978). 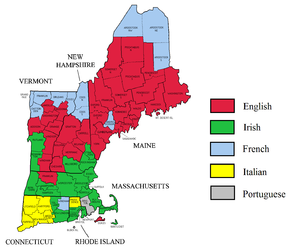 The Portuguese in America. This page was last edited on 21 April 2019, at 19:55 (UTC).